Lowongan Kerja PT Yodya Karya (Persero) - Yodya Karya or later known as YOKA is a reputable consulting service company in Indonesia which has attained ISO 9001:2008 Quality Management System Certification, for the scope of Consultancy of Architects, Engineering and Management. YOKA is a state-owned company with majority share holder by the Government of Indonesia. YOKA concentrates its business activities in consultant planner services, including architects, engineering and management consultant services. Originally registered as Dutch company under the name of Naamloze Vennootschap Job en Sprey (NV Job & Sprey) in 1948. 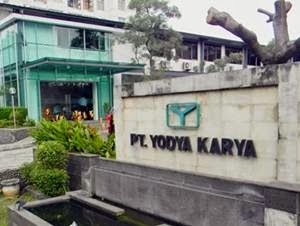 PN Yodya Karya was launched in 1958 as a nationalization results of NV Job & Sprey. In 1972, PN Yodya Karya transformed into PT Yodya Karya (Persero). Headquartered in Jakarta, YOKA now has 5 regional offices and 5 branches throughout Indoensia. In terms of financial performance, YOKA reported total contract value in 2011 amounted to Rp 222.92 billion. This reflected an 36.60% increase from Rp 163.18 billion in 2010. Ready to work hard and be able to work in teams. Fluent in English, both active and passive. Have SKA will be an advantage (2, 3).